Moel Famau / Clwydian Range at Moel Famau / Clwydian Range (NRW)0300 065 3000work Forest or WoodlandMoel Famau Country Park is at the heart og the Clwydian Range Area of Outstanding Natural Beauty. Rising to 554m Moel Famau forms the highest point on the Clwydian Range summit chain. Access is straightforward from Bwlch Pen Barras car park and Coed Moel Famau car park. At the top lie the ruins of the Jubilee Tower, an iconic monument visible from all directions, with a wonderful outlook across North Wales and North West England. You can walk through the forest from the Coed Moel Famau car park to the summit of Moel Famau. There are several other circular walks of different lengths from the Coed Moel Famau car park and a mountain bike trail which is graded blue (moderate difficulty). For younger visitors, there is the Forest Tracker Trail and the popular Hawk's Nest play area. The Clwydian Range Centre next to the car park in Loggerheads Country Park is an ideal place to find out more about the Clwydian Range and get a walking guide or map. Loggerheads Country Park is three miles south west of Mold, signposted on the A494. The car park at Loggerheads is managed by Denbighshire County Council. There is a charge for parking. The nearest train station is in Buckley. The OS grid reference is SJ 200 628. 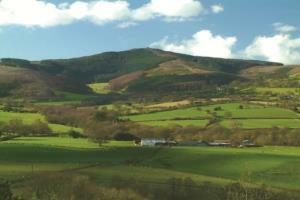 Moel Famau Country Park is at the heart og the Clwydian Range Area of Outstanding Natural Beauty. The all ability trail is a short, picturesque route that meanders across and alongside a stream. Facilities include: disabled parking disabled toilets The toilets are open from 8am to 6pm (October to March) and from 8am to 9pm (April to September). Play area: The popular Hawk's Nest play area encourages children to learn and explore the woodland environment. It is suitable for children aged 2 to 14 years and includes: a giant Sleepy Cedar to climb inside a Giant Hawk’s Nest to climb and crawl through a Bird Cradle to swing inside Stones Flow to splash and paddle in. There is a numeracy trail for teachers to use with their pupils and an outdoor classroom area at the back of the arboretum. Directions: From the north: take the A494 from Mold through the towns of Gwernymynydd and Loggerheads, until the junction with 'Moel Famau Country Park' signposted to the right. Follow this road for one mile, and the car park is on the right. From the south: take the A494 from Ruthin towards Mold. After passing through the village of Llanferres turn left at the junction with 'Moel Famau Country Park' signposted. Follow this road for one mile, and the car park is on the right. The OS grid reference is SJ 161 627. Please note: Sometimes we need to close or divert trails for your safety whilst we undertake maintenance work or forest operations. Occasionally we may have to close a site in extreme weather, such as high winds or snow and ice due to the risk of injury to visitors or staff. Please always follow any instructions onsite and make sure you follow any temporary diversion signs in place. There is a charge for car parking. Moel Famau is in Moel Famau which is part of Clwyd. From Mold take the A494. Follow this road through the towns of Gwernymynydd and Loggerheads, until you come to a junction with 'Moel Famau Country Park' signposted to the right. Follow this road for 1 mile, you will see the car park on your right hand side. Mold is the nearest town or village.